The Ryogoku Bridge is linked to the history of Japan. The Tokugawa Shogunate relocated to Edo (what is now Tokyo) in 1603. The Tokugawa rulers were so concerned about being attacked that they prevented bridges from being built across the Sumida River (except for the Senju Bridge upstream of the capital). However, a fire in 1657 destroyed Edo and killed thousands of people who were unable to get across the river to escape the inferno. The Shogun then allowed the Ryogoku Bridge to be built. The human figure plays a large role in the prints and paintings of the Ryogoku Bridge. 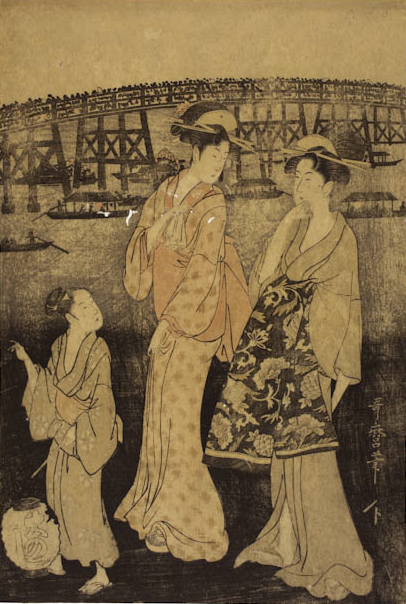 In the woodblock print from 1796 (shown above) the ukioy-e artist Kitagawa Utamaro shows his skill at drawing elegant people with the Ryogoku Bridge behind them almost an afterthought. Note how the Ryogoku Bridge always seems to be crowded. Perhaps the drawing was made in the evening when people congregated on the bridge to enjoy the cool breeze. 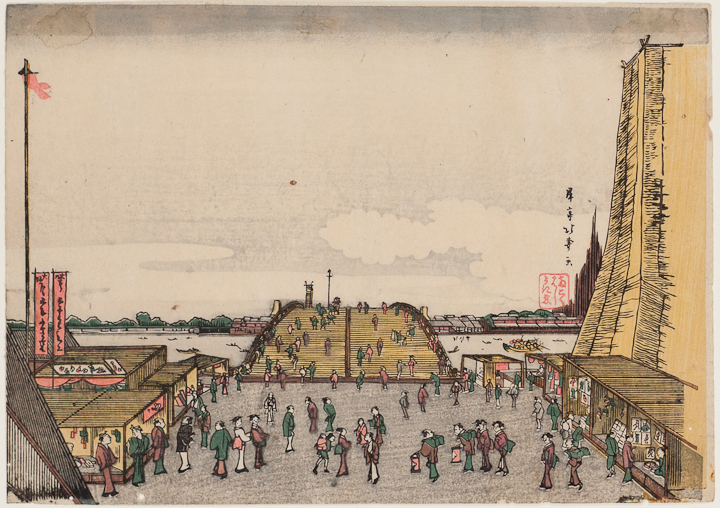 The print above is entitled 'Breezes at Ryogoku' and was made by Kikugawa Eizan around 1810. 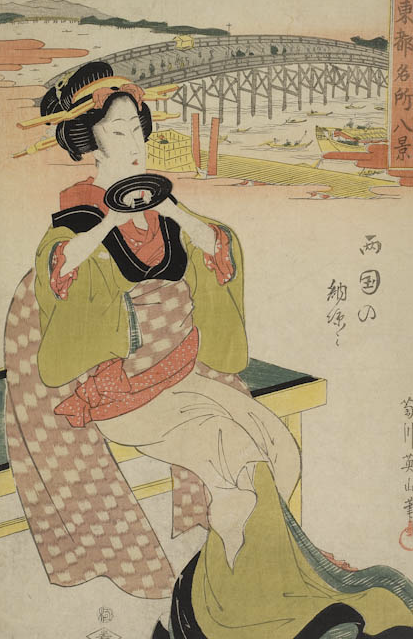 It is another example of the ukioy-e style that emphasizes elegant people in front of a landscape. The print was from the series 'Eight Views of Famous Places in the Eastern Capital. 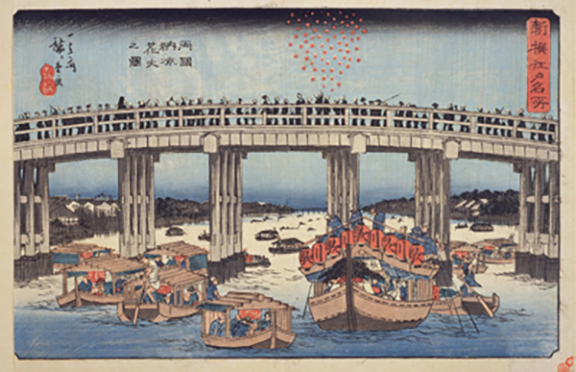 In the print by Hiroshige shown above (from 1814) the Ryogoku Bridge is crowded with people enjoying a fireworks display on the river. Note how Japanese woodblock prints often include painted details beside the images produced by the woodblock. Hiroshige's print was the inspiration for the opening scene in the recent film 'Miss Hokusai,' which examined Katsushika Hokusai's life from his daughter's point of view. In the movie we first meet his daughter walking across the Ryogoku Bridge. The filmmakers made drawings based on Hiroshige's print to provide a realistic portrayal of what it was like to walk across the bridge. Perhaps the filmmakers also referred to the print above, that was also made in 1814 by Shotei Hokuju and shows what it would have been like to step onto the deck of the old Ryogoku Bridge. Note the many shops, theaters, and print sellers at the foot of the bridge. The painting above was made by Hiroshige II around 1860. When an artist is successful they attract other artists who become part of a school based on the artist's name. Hiroshige II was a student of the school of Hiroshige and continued in his master's style after the original Hiroshige's passing. This painting was one of two scrolls showing the seasons summer and spring. 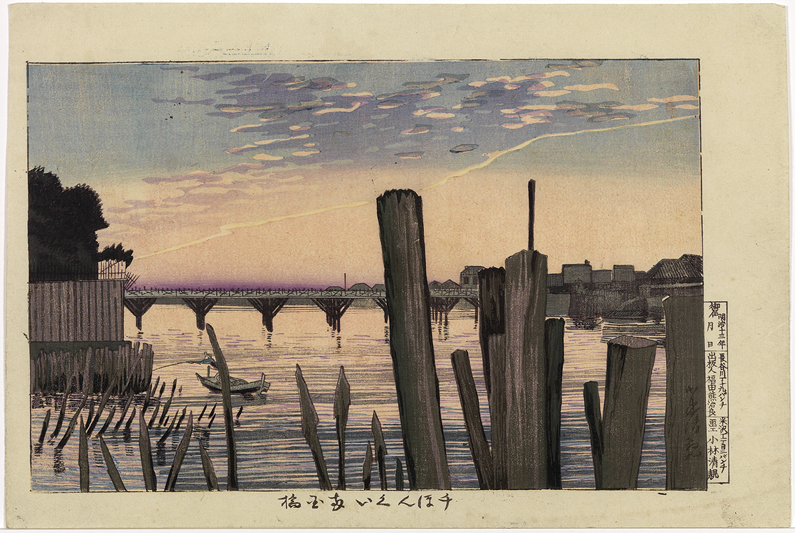 Two women are seated at the landing for the Ryogoku Bridge under a willow tree. The bridge is in the middle ground and Mt Fuji is in the background. We previously discussed the woodblock artist Kiyochika with his realistic style of representation borrowed from Western artists. This back and forth between Japan and the West invigorated the art of both cultures. 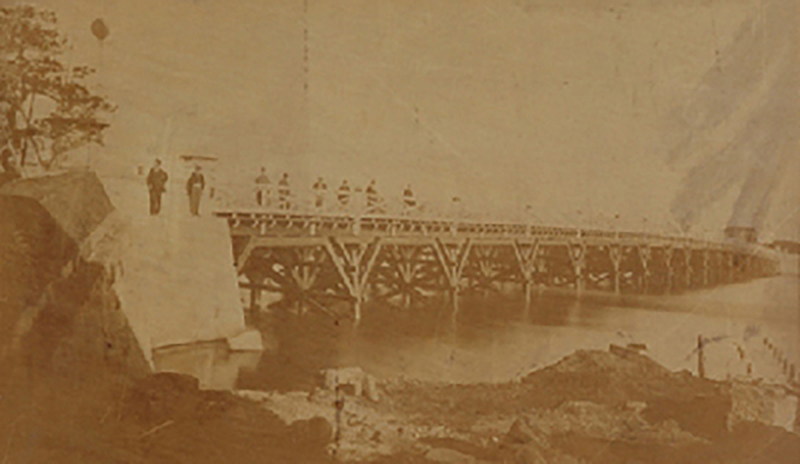 This print from 1875 shows the bridge from the eastern shore where hundreds of stakes were planted to prevent erosion of the riverbanks. Note the bridge now has haunches below the deck to help support the superstructure. The Ryogoku Bridge was rebuilt many times as a result of damage from flood, fire, and age. The photo above was taken at about the same time as the Kiyochika's print and was the last wooden bridge built at this site before it was replaced by a steel truss.